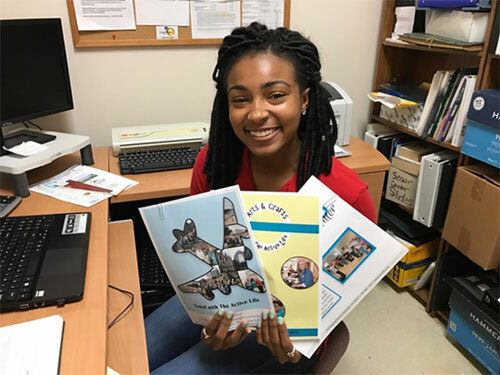 Prior to interning with Troup County’s Senior Center, which is part of their parks and recreation department, graphic design major Kayla White was largely unaware of the operations of county government. However, upon completion of her internship, White now has a much better grasp of the operations of county government and a much greater appreciation for all of the work that they do in serving the public. During the course of her internship, White was tasked with developing a marketing strategy for the Active Life Senior Center in order to increase attendance at the events and programs that the center offers and to spread the word about some of the county services that are available to Troup County residents. White also worked on developing brochures, flyers, and a new logo for the center and played an integral part in updating of their social media sites. For White, the most significant success of her internship was the opportunity to engage with the public in understanding how better to reach them with the center’s marketing and advertising. White is also extremely proud of the work that she did in designing the organization’s new logo and slogan in seeking to give the center a fresh start. Reflecting back on her internship experience, White feels that she significantly strengthened her marketing abilities, in that she was able to understand what it was that the public wanted to see in the center’s advertising and marketing. She also gained experience working with certain design software, something that will benefit White in her coursework at LaGrange College. White strongly encourages future interns to apply for intern positions in county government, as it is a great way for one to gain hands-on experience in the field in which they wish to work. As for her future, White says that she is now considering a career in county government.